Bristol, Tennessee was the site of J.D. McDuffie’s first NASCAR start on a track still on the Monster Energy Cup Series Schedule. The day was Sunday, July 28, 1963, just the sixth race run at “Thunder Valley.” McDuffie campaigned the #76 that day – his first Cup start in his traditional #70 wouldn’t come until three years later at Rockingham – and started his Ford 33rd on the 36-car grid for the Volunteer 500. McDuffie finished the race under power in 19th, 75 laps down to a victorious Fred Lorenzen. Statistically, Bristol was one of McDuffie’s best tracks. Only the Nashville Fairgrounds, site of last Saturday’s ARCA Racing Series event, saw McDuffie earn more Top Fives and Top Tens. Appropriately, according to racing-reference.info, he completed just a fraction over 70% of the laps he ran there – 13,389 of a possible 19,119. McDuffie earned his first Bristol Top Ten on July 21, 1968 with a 10th-place showing in his 1967 Buick, this time 37 laps behind a dominant David Pearson. Over the next ten Bristol races run through 1973, McDuffie would earn another six runs of 10th or better. The streak was capped by a pair of 5th-place showings, his best at the short track. The first, a Bobby Allison victory on July 9, 1972, saw McDuffie drive a 1970 Dodge fielded by Dr. Don Tarr with sponsorship from Pepsi and the nearby Johnson City Sheraton. 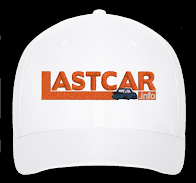 The second came the following year, July 8, 1973, when Benny Parsons bested future XFINITY Series standout L.D. Ottinger by seven laps. McDuffie’s own 1972 Chevrolet was 27 laps down that day. Three times, McDuffie’s day at Bristol ended with a last-place finish, though none occurred after November 2, 1975, when his engine let go after 7 laps (the other two were another blown engine after 27 laps on March 23, 1969 and a loose oil line after 18 laps on March 28, 1971). In fact, he finished half of the 22 Bristol races he started from 1976 onward, including all seven from 1981 through 1984. His ninth and final top-ten run at the track came on August 26, 1978, the day Cale Yarborough led 327 laps. McDuffie’s Bailey Excavating Chevrolet ran 8th that time, 19 laps down. Among those he bested were Bobby Allison and Neil Bonnett. Qualifying issues caught McDuffie Racing by 1985, and he made just three more starts from the spring race onward. His final green flag there took place on April 8, 1990, the day Davey Allison edged Mark Martin in a thrilling photo finish. McDuffie, meanwhile, started 30th in the 32-car field, edging Chad Little and Larry Pearson for a spot in the field. He finished 27th, his Pontiac out with engine trouble after 290 laps. 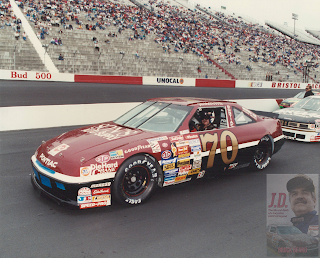 The following spring, McDuffie made his final Bristol attempt, and his first of the 1991 season driving the burgundy-and-black colors. 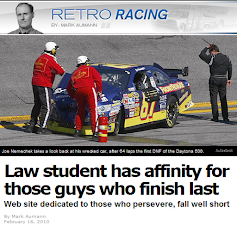 He and fellow owner-drivers Jimmy Means and Dave Marcis failed to make the field. Reserve your copy of "J.D. 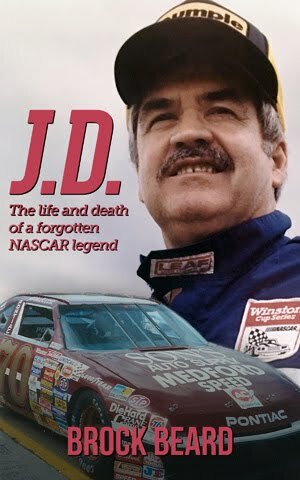 : The Life and Death of a Forgotten NASCAR Legend" at Waldorf Publishing, coming July 15, 2018. Click here for more details. Oh, my most humorous memory of J.D. 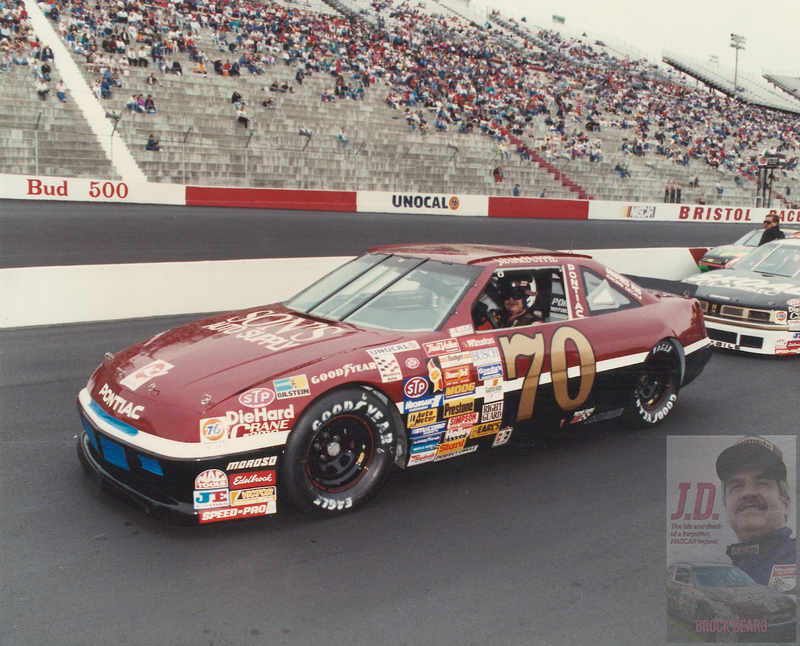 McDuffie at Bristol was probably around 1987 or'88 because I'm pretty sure he was driving a Pontiac 2+2 at the time. But it was Friday night and qualifying time for the Cup cars. ESPN was showing the qualifying and I remember Benny Parsons was announcing. J.D. came blasting around the 4th turn and suddenly got out of the gas and dropped down on the track. Because there was a woman out on the track asking the flagman where she needed to go! Somehow, she had gotten out on the track and couldn't figure how to get back where she came from!! I remember Benny saying, "Oh good Lord, how did she get out there on the track?" And if you've ever been to a race track with that crowd when something of this nature occurs, she heard a resounding chorus of cheers and hoots from what was a huge crowd at Bristol on Friday nights back then. 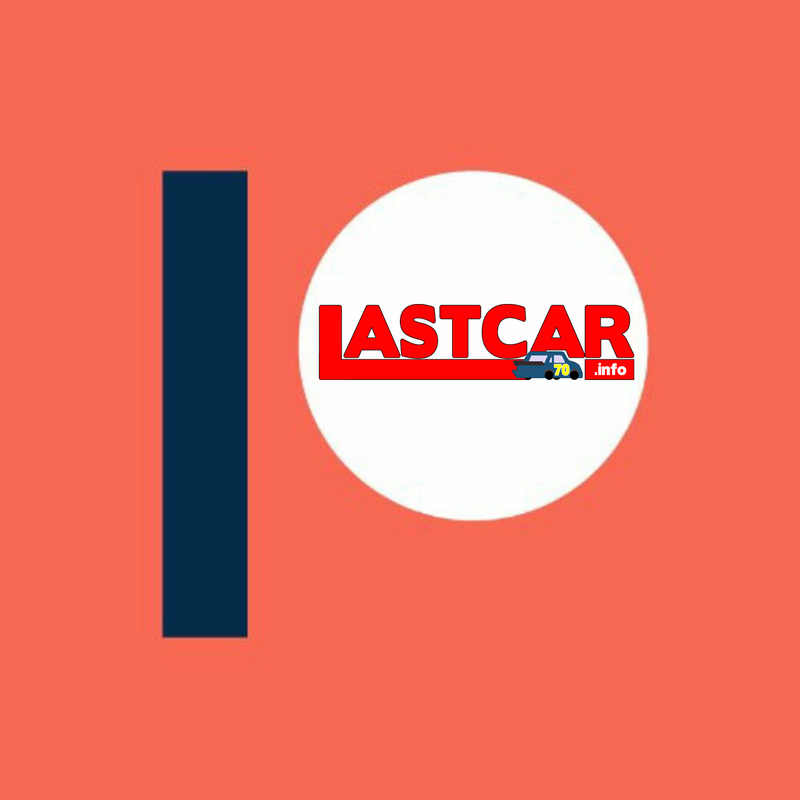 The flag man directed her back to the wall at pit road and as she semi-trotted down the track, the hooting and hollering continued. You had to feel sorry for her enduring all of this but it really was funny.